Edinburgh defeated Jed-Forest 29-19 in a frenetic Melrose Sevens final to lift the Ladies Cup trophy. Tongan duo Will Helu and Otulea Katoa cancelled out Gregor Young's opening try in the first half. Hulking Samoan Sasa Tofilau blasted through two tackles to seal Edinburgh's victory with the last play. 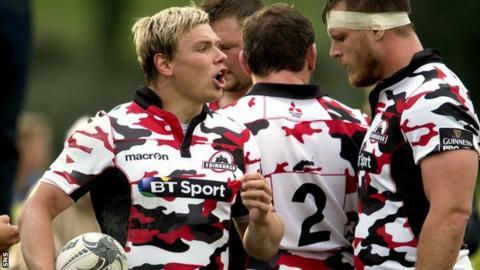 No amateur team has won the tournament since the host club prevailed in 2011, and that trend continued with Roddy Grant's Edinburgh, on their first invitation to compete, crowned champions following wins in the past two years by inter-city rivals Glasgow Warriors. Edinburgh knocked out Melrose in the semi-final, having defeated GHA and Heriot's. Meanwhile, Jed-Forest saw off the challenge of Selkirk, the visiting Belgium side and Edinburgh Academicals.